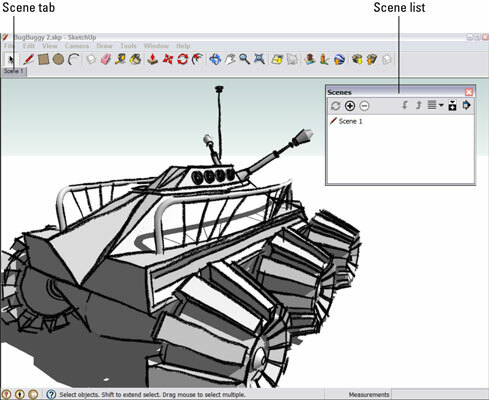 Making a scene in Google SketchUp is not like taking a snapshot of your model. If you create a scene to save a view, continue working on your model, and then return to that scene, your model doesn’t go back to the way it was when you created the scene. The camera position will be the same, and the settings will be the same, but your geometry won’t be. A scene is just a set of view settings, which means that they’re automatically updated to reflect your changes every time you edit your model. You can make some scenes and use them all the way through your process. Choose Window, Scenes to open the Scenes dialog box. Set up your view however you want. Click the Add button to make a new scene with your current view settings. The SketchUp design team added a handy new feature to SketchUp 8: thumbnail images of your scenes in the Scenes dialog box. To see them, just click the View Options button and choose either Small Thumbnails or Large Thumbnails. Nothing is generated outside of SketchUp when you add a scene; it’s not like exporting a JPEG or a TIFF. Scenes are just little bits of programming code that “remember” the view settings in effect when they’re created. Scenes also don’t add much to your file size, so you don’t have to worry about using too many of them.